Looking to update your kitchen with added storage, extra workspace, and general value this year? Whether you are looking for kitchen island ideas for small kitchens or you have abundant space to work with, there’s a perfect kitchen island idea that will work for your home. 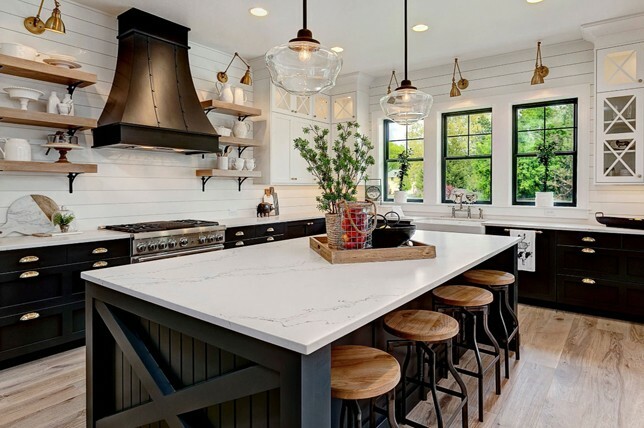 From bold colors to smart storage solutions, here are over 20 of the best kitchen islands for your 2019 kitchen renovations from our expert contractors and interior designers. If you aren’t blessed with loads of ample space in your kitchen, or if it’s an awkward space, kidney or bean-shaped kitchen island ideas might be the best alternative for you. They wrap around you, taking up less space than a square kitchen island and there are no sharp corners to knock into – perfect for smaller spaces and for households with kids who are prone to running into things. Kitchen islands are traditionally square but squares just don’t fit everyone’s space. A rectangular kitchen island may suit the size and shape of your kitchen much better. On a longer island, you can fit much more workspace ideas. Longer kitchen islands are also great for hiding your bulky appliances (like an oven) as you can have them out of sight, making your kitchen look minimal in design, spacious, and stylish – making it one of the most effective and easy kitchen island ideas you should consider. A mirrored kitchen island will look glamorous in even the most standard of kitchens. Its reflective surface will make your kitchen seem as if it’s larger and brighter and it’s also a clever way of disguising a kitchen island taking up valuable floor space in the middle of your kitchen. Smaller mirrored panels can also conceal dead space or cover drawer fronts; mirrors make for stylish kitchen island decorating ideas. Circular or oval kitchen islands are another great option if you need a small kitchen island. Taking up much less space as there are no corners, and no wasted space either – they make for great kitchen island ideas for small spaces. Circular islands are best for giving you extra counter space and storage as you’ll be hard pressed to fit a dishwasher in one. Oval kitchen islands lend themselves spectacularly to a breakfast bar space, so be sure to make use of their socially appealing shape with bar stools. A breakfast bar is a wonderfully social way to eat and entertain and it’s perfect for more casual meals in the kitchen. A small kitchen island can be put to use as a breakfast bar, seating plenty of people. Alternatively, create an overhang on one side of your kitchen island (whatever else you are using it for) to make a dual-purpose island – a great kitchen island idea for a small kitchen. If it’s time to introduce color into your kitchen, then a contrasting kitchen island is a smart route to injecting brilliant color in it. Installing a different colored kitchen island enables you to contrast the color of the units with the rest of your kitchen. We are loving autumnal tones and deep blues for kitchen island decorating ideas as they’ll lend your kitchen color thats warm and inviting, plus, it will never go out of style or look outdated. If you love creating delicacies out of pastry or bread, then why not turn your kitchen island ideas into a pastry prep station or something dedicated more to your style of cooking? Pastry and bread making surfaces are lower than a standard work surface, allowing you to work your dough more easily. Marble is a great material surface for working pasty, so go for a marble-topped kitchen island. If you have space to fill (and you have a generous kitchen island ideas budget to work with) then fill it with a sweeping asymmetrical kitchen island. This can be used to create additional seating, or as space for your sink, counter space, and extra storage. Or, simply use it to make a strong visual impact with a contrasting color and material. Big fan of wine (we are too)? Then what better use for your kitchen island than styling it to double as a home bar? Get the look by creating plenty of storage for bottles to easily access them as you need them. Add shelf space for wine glasses and integrate a wine fridge so you can keep your wine chilled. Add an overhang for a breakfast bar, so you and your friends can perch on chic barstools and discuss the day’s events over a large glass of vino. An island full of basket storage is a stylish and practical way of keeping all of your kitchenware together and they make for good kitchen island ideas on a budget. Plus, baskets look so charming – go for a wood-topped island with cream baskets, or even consider a grey and white combination for your kitchen island color ideas. High-shine metallics are seriously trending and they make for ultra-chic kitchen island ideas that are sure to add a heady sense of everyday glamor into one of your most commonly used spaces. Choose a stainless steel for an industrial kitchen island or antique brass or gold for something a little warmer. The whole island doesn’t have to be metallic – top with wood or marble to soften the look – easy kitchen island ideas which make an impact. Create surface space in your kitchen by moving your cooker to your kitchen island. It frees up the original surface space and allows you to cook in a more centralized manner. If you need kitchen island ideas for small spaces, have your pots, pans, and utensils hung over the island, as this will also be giving you easy access to your kitchen equipment while you are prepping and cooking. Moving the sink onto a kitchen island makes a nice feature out of a traditionally boring kitchen necessity. It creates extra workspace and centralizes your room, even with a small kitchen island. Make an impact with a statement tap – be bold and choose a gold tap, or something ornate and interesting. This doesn’t have to cost a lot, so it won’t exceed your kitchen island ideas budget. Butcher’s blocks are perfect kitchen island ideas for small space. They can be moved around easily (especially if they are on wheels), they have plenty of storage and the added bonus of evoking a warm rustic industrial feel. We love dark finished butchers blocks with traditional wooden tops for kitchen island color ideas; they look great in traditional and modern kitchens alike. Cookbooks should be stored in the kitchen, but there often isn’t space for them, so they lay in a cupboard, forgotten, until promises of holding a dinner party jog your memory. 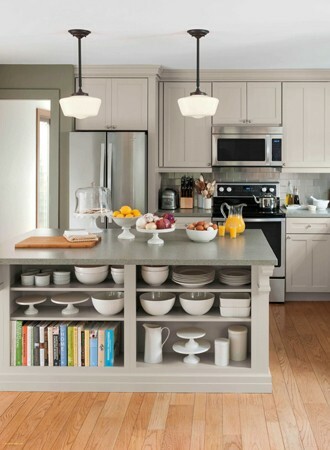 Having shelving on your kitchen island means that cookbooks can easily be stored and referred to into the kitchen while being an arm-lengths away. The epitome of kitchen islands is an ode to country style – warm oak cabinetry topped with ceramic tiles for something a little different, even solid oak islands with cute gingham curtains to hide what’s stored beneath (great for kitchen island ideas on a budget). A weathered, warm, and well-used look is what you are going for here. As you well know, not all countertop levels were created equal – some jobs are best done at a lower level and some are best done at a higher level. A kitchen island affords you the opportunity to have a multi-level surface, so you can easily wash and chop at one end and sit and eat at the other. Not only does open shelving keep your kitchen items accessible, but they make for stunning kitchen island ideas. Open shelving on your island allows you to store jars of spices and dried goods, or tableware or pots and pans (whatever your heart desires). They are easy to access, and they make for a lovely feature when stylized and well-judged. Kitchen islands don’t have to take up your entire kitchen, nor do you need a giant kitchen to accommodate one. Paring down the traditional kitchen island to the bare essentials means you can fit one in pretty much any sized kitchen. Looking for more counter space? Open up the space with an island on legs – stools can be tucked under for additional seating and shelving can be added for more storage. But it doesn’t have to be big. If you’ve got ample floor space to work with, an extra wide kitchen island will offer you plenty of additional storage and surface space while creating a stunning impact. And if one isn’t enough or looks off, two kitchen islands can make for an impressive feature that will add plenty of value to your home. For a sleek and sophisticated look thats worth the investment, a waterfall countertop in elegant marble will make for a gorgeous touch to your kitchen island. Just be sure that you’ll be happy with the look and feel of the surface you bring in to ensure that your investment will stand the test of time and that you won’t tire of it in a short amount of time. A tonal all-white kitchen island will make for a minimal statement while making your kitchen appear larger and brighter. Plus, we love how the clear Stark barstools were introduced into the kitchen featured above as they also make for a subtle impact that’s seriously stylish. Looking for a unique kitchen island idea? An eclectic take will make your kitchen island a memorable standout like the one pictured above. The countertop overhang keeps the overall look quiet yet full of bold richness and visual play. Keep the look clean and easy to care for by opting for a metal kitchen island that’ll lend your home a sense of industrial cool for years to come. If you’re under the impression that kitchen islands have to take a considerable amount of floorspace, there’s plenty of minimal kitchen island ideas to prove you wrong. Go for a clean and serene look by creating a slim kitchen island with matte finishes for a subtle statement. If you’ve got a large kitchen and entertain often, a massive wrap around kitchen island will benefit you for years to come. Our interior designers loved the kitchen island featured above as an example as it truly offers so many valuable amenities including extra comfortable seating, and nooks for decorative items. If you’re in a rental or are looking for kitchen island ideas on a budget, you can easily source a stylish and practical kitchen island that you can move with you and move around when its not needed. Plus, they can easily be found for just a few hundred dollars or less.